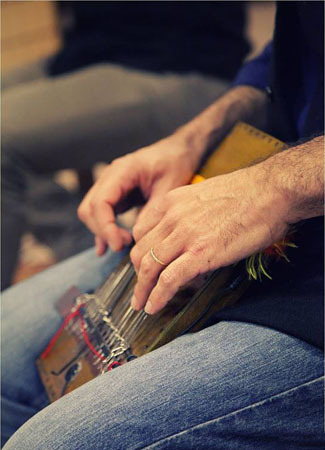 Ethnomusicologist – PhD Durham University UK- and musician, Paolo Pacciolla teaches ethnomusicology at the Conservatory of Music A. Pedrollo of Vicenza. His research interests include a number of interrelated areas within ethnomusicology, organology, iconography of music, history and archaeology of music and musical instruments, and religious studies. He is particularly interested in the ritual functions of music, musical instruments and dance, and in the relationship of music and images – intended as painted or enacted representations – in India. 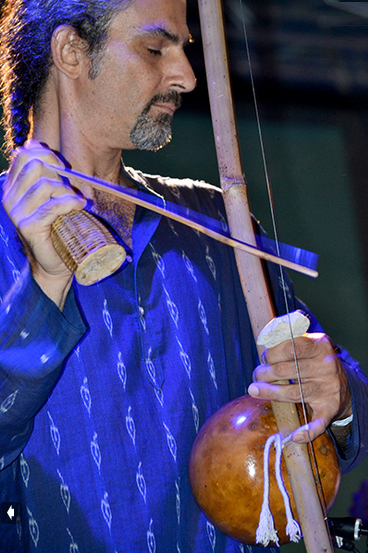 His main ethnographic focus is on music in India, where he has carried out extensive field research on the language and ritual functions of drums and drumming. He is author of the monographs Il pensare musicale indiano (Besa, 2005) and La gioia e il potere. Musica e danza in India (Besa, 2008), co-authored with Luisa Spagna, and has directed the video research Essence of Odissi dance. The making of a tradition (Sutra Arti Performative 2016) based on a project of Luisa Spagna https://sutraartiperformative.com/produzioni/. 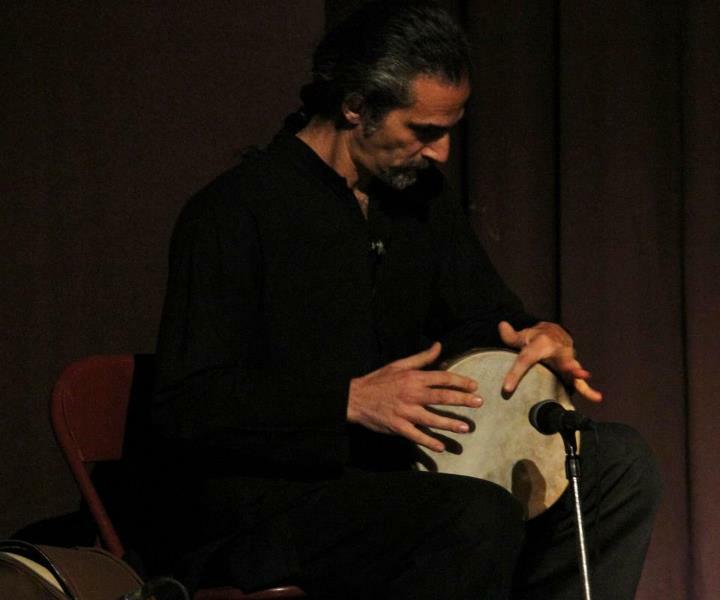 Since 1992 he has been performing as soloist and collaborating with numerous musicians in the context of jazz music, Persian music, ancient and folk music. Improvisation has always been his favourite way of musical expression. 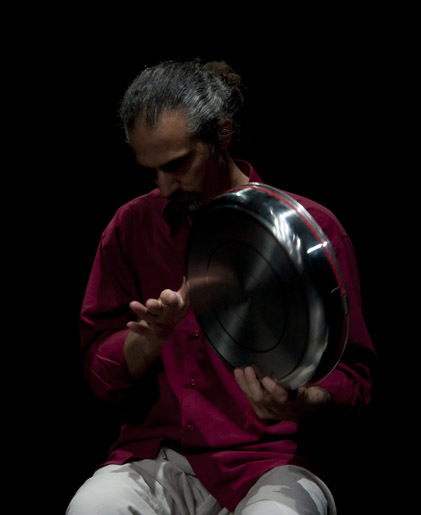 His journey in the sound of musical instruments started from piano and went through frame drums from different geographical regions, drums from Iran (daire and tombak) and India (pakhavaj), musical bows and lamellaphones from Africa, and is now continuing through instruments created by himself (axis) (https://sutraartiperformative.com/2013/10/16/axis-a-new-musical-instrument/) and any other sound producing object. 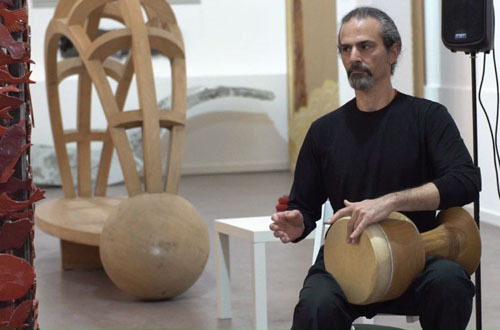 Enchanting Circles (Alfa Music 2011), his first solo recording for tuned frame drums (created by himself), rattles and voice results from his research on frame drums (https://sutraartiperformative.com/recordings/) while other aspects of his research on sound and musical instruments have found expression in FREE-DOT, a project of improvised music which he runs together with the flutist Antonio Cotardo; they published Ariband (Slam 2010), a suite for flutes, frame drums, mbira and voice, Just Flux! (Slam 2013) an improvised session for flutes, berimbao, mbira, Jew’s harp, a set of stones, steel lids, bells, nuts, reed and shell rattles, voice and the piano, played directly from the strings and used as resonant witness, and Echoes (Sutra Arti Performative 2016) a journey through five pieces for flutes, mbira, axis, steel lids, mouth harp, rattles and voice (https://sutraartiperformative.com/free-dot-recordings/). The collaboration started in 1992 with the dancer Luisa Spagna introduced him to the world of dance and theatre, and gave him the chance to experiment how music and different instruments may relate with the movements of the dancing body. In 2003, they founded the cultural association Sutra Arti Performative with the aim of producing original performances and publishing both creative projects and researches on performing arts of India. Their productions include Karà 1995 (https://sutraartiperformative.com/kara/), Oltre la forma 1997/2001 (https://sutraartiperformative.com/oltre-la-forma/), Sens-azioni 2002/2006 (https://sutraartiperformative.com/sens-azioni/), Shakti 2004, Il canto del gesto 2004, Natyanjali 2004, Sagar 2005, Lune 2006 (https://sutraartiperformative.com/lune/), Matrika 2007 (https://sutraartiperformative.com/matrika/), India : tra ritmi e stili di danza 2008, Shekara 2009. Yogini- Enchanting Circles 2014-2016 (https://sutraartiperformative.com/yogini-circles/). .2013 – “Battere nuovi ritmi. Prospettive per il futuro del tamburello salentino”, Melissi – Le culture popolari, 22/23, Besa, Nardò.
. 2008 – “La gioia e il potere. Musica e danza in India”, Besa 2008, Nardò.
. 2008 – “Infinite danze nascoste”, Melissi – Le culture popolari, 16/17, Besa, Nardò.
. 2007 – “Ghetonia. La tradizione e la creatività”, Melissi – Le culture popolari, 14/15, Besa, Nardò.
. 2007 – “La musica e la via. Il tambur e gli Yaresan”, Melissi – Le culture popolari, 14/15, Besa, Nardò.
. 2006 – “Tamburi e simboli. Strumenti musicali e identità”,Melissi – Le culture popolari, 12/13, Besa, Nardò.
. 2005-“Il pensare musicale indiano”, Besa Editrice, Nardò. .2005-“Tradizione/ innovazione: contrapposizione o complementarità?”,Melissi – Le culture popolari, 10/11, Besa, Nardò.
. 2004 – “La musica Indiana: una ‘via’ melodiosa per la libertà.”,Melissi – Le culture popolari, 8/9, Besa, Nardò.
. 2004- “Kalamukha, il grande divoratore”, Mimose, Lecce.
. 2003 – “Metafisica e cosmologia del suono“, In Corso d’Opera, University of Lecce.
. 2003 – “Una tradizione in movimento. 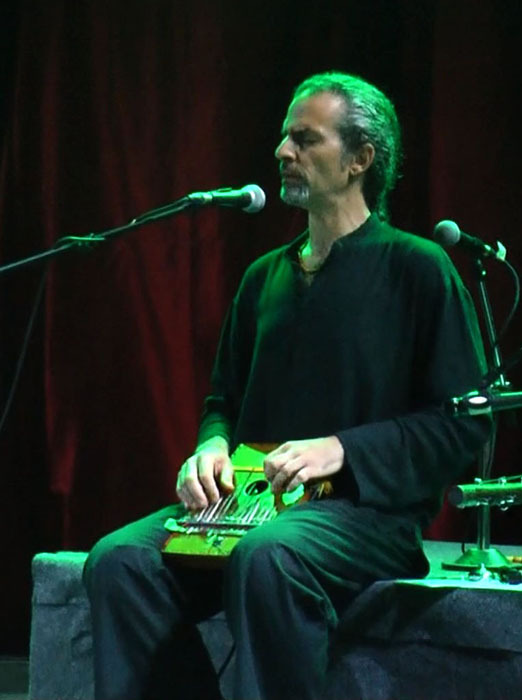 La musica persiana nel continuo rinnovamento delle forme“, “Il calice dell’ebbrezza ritmica”, Melissi – Le culture popolari, 6/7, Besa, Nardò.
. 2002 – “La via mistica del Mridang-Pakhawaj“, XI National Meeting of National Association for Sanskrit Studies, Milan. 2007- “Ritmi vegetali e linguaggi artistici“, Atti del Tredicesimo Convegno Nazionale di Studi Sanscriti, Rome. 2009 – “India before Europe”, by C.Asher e B.Talbot (Cambridge University Press) for Besa Editrice. “Just Flux!”, FREE-DOT, Slam Productions, UK, 2013. “Ariband”, FREE-DOT, Slam Productions, UK, 2010. 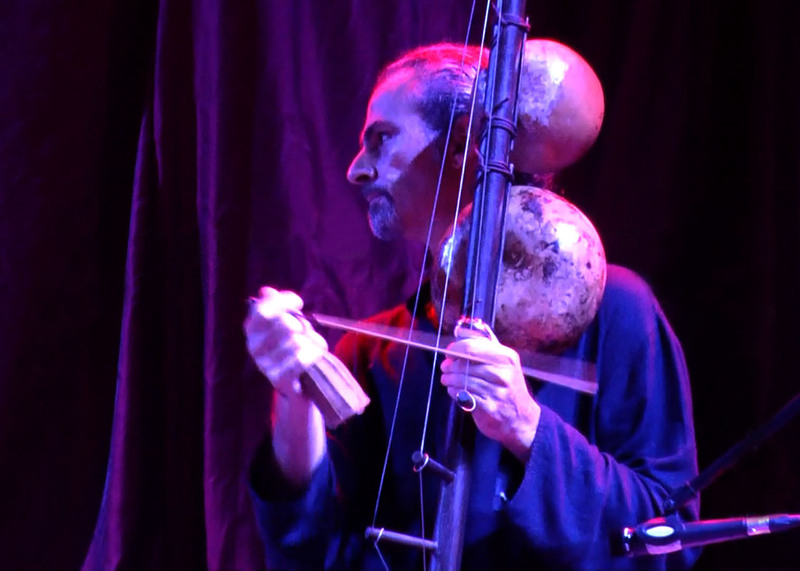 “Enchanting Circles”, Paolo Pacciolla, Alfa Music, Roma, 2011. “Round Circle”, Beppe Camozza Quartet, Penta Flowers, Rome, 2000. In 2003 he founded, together with Anna Luisa Spagna, the cultural association Sutra Arti Performative producing performances and researches on Indian art and culture. Since 2004, Sutra Arti Performative collaborates with the University of Salento, chair of History of Indian Arts, for the organization of conferences and seminars on the arts of India. 2005, November 7/15. “Visioni dell’India”. University of Lecce, Dipartimento di Beni delle Arti e della Storia. 1) Workshop of Odissi Dance held by Shagun Butani of New Delhi. 3) Lecture-demonstration of classical Indian Dance, Natyanjali.Shagun Butani: Odissi Dance and Luisa Spagna, Chhau Dance of Seraikella. 2004,10 June – Signum, Performance organized by Sutra Arti Performative, University of Lecce, E.D.i.S.U. of Lecce, Conservatorio di Musica “Tito Schipa” of Lecce. 2014 -18 February, Yogini Circles, Lalit Kala Akademi, New Delhi. 2014 -01 March, Yogini Circles, Niv Art Centre, New Delhi. 2013 – 21 March, Enchanting Circles-Matrika, Istituto Italiano di Cultura di New Delhi. 2012 – 31 March, Stringing. Contemporary Impressions of Rhythm and Movement. Triveni Auditorium, Mandi House, New Delhi. An Indo-italian production: Sudhaaya Dance Foundation (India), Sutra Arti Performative (Italy), under the patronage of the Istituto Italiano di Cultura of New Delhi. Dancers: Shagun Butani, Luisa Spagna, Asha Kumari. 2011 – Sussistanako, La Donna Ragno, Concept, Choreography and dance L. Spagna; music: P.Pacciolla. 2009 – Shekara, Concept, Choreography and dance L. Spagna; music: P.Pacciolla. 2009 – La danza dei gesti delle cinque Dakini, Concept, Choreography and dance L. Spagna; music: P.Pacciolla. 2007 – Sagar, Concept, Choreography and dance L. Spagna; music: P.Pacciolla. 2006 – Matrika,Concept, Choreography and dance L. Spagna; music: P.Pacciolla. 2005 – Lune, Concept, Choreography and dance L. Spagna; music: P.Pacciolla. 2005 –Lectura Dantis, choreography and dance, L.Spagna; music, Paolo Pacciolla; recitation, D.De Blasi. 2004 – out-corner, March-April, a cycle of lectures and performances at the Conservatoriodi Musica ‘Tito Schipa’ of Lecce for the jazz course of Maestro L.Bubbico. Dance, L Spagna; music, P. Pacciolla and R. Gagliardi. 2004, AN-KI Farfalle tra cielo e terra, La danza all’Aventino, Mediascena Europa, Rome. 2004, Quattro toni e il quinto elemento, Altaromaaltamoda, Auditorium Parco della Musica, Rome. Choreography and dance: L. Spagna, M.L.Sales, Music: P.Pacciolla, artistic objects: L. Raciti. 2002, Sens-azioni, Festival ‘Teatro dei Luoghi’, Cantieri teatrali Koreja, CEE, University of Salento, Comuni della Valle della Cupa. XXVI International festival di Tagliacozzo (AQ). Choreography and dance L.Spagna; music and video, P.Pacciolla. 1997, Oltre la forma, Festival of the art and culture of India, organized by the Embassy of India in Rome and Argilla Teatri. Choreography and dance L.Spagna; music and masks, P.Pacciolla. Rome. 1995, Karà, Choreography and dance L.Spagna; music and masks, P.Pacciolla. Rome.